Migraine Relief Center was founded in Houston, Texas by two brothers, Drs. Mark and Christopher Khorsandi. The board-certified surgeons, armed with their proprietary migraine treatment methods, knew they had a solution that could help migraine-sufferers find relief, but they needed to get the word out. When they came to us, Migraine Relief Center was a 2-man startup with a brand new location in Houston and no patient base to speak of. Their top priority was to get their name out there, get patients into their clinic, and to grow their business. To help get the business off the ground, we focused on producing valuable content for prospective patients. With such a specialized business, we knew education would be a major part of our marketing, so the content we produced was designed to answer questions and familiarize prospects with their innovative migraine therapies. 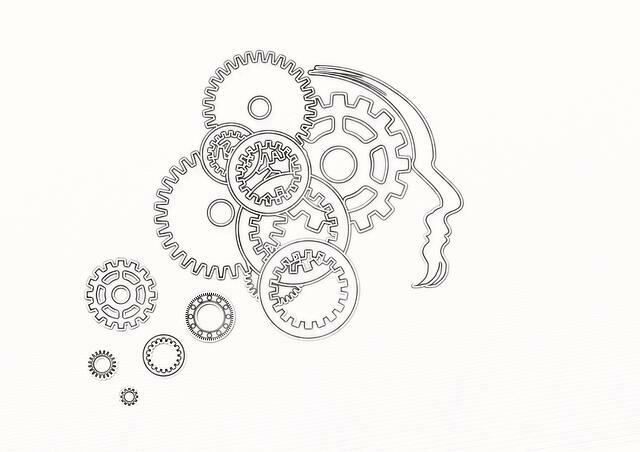 Another key component would be a vibrant social community for migraine sufferers to discuss their personal experiences with one another. Once we combined that with some SEO and PPC campaigns, Migraine Relief Center started to see an influx of new patients. The revenue generated from our marketing efforts helped Migraine Relief Center open 3 additional clinics in Dallas, Los Angeles, and Las Vegas. This meant new markets for us to tap into. Migraine Relief Center was poised for more growth, and they were looking at us to make it happen. Content was at the heart of our campaign. With a series of highly-targeted educational blog posts, we were able to land features on many coveted industry websites as well as being cited as a resource on DailyMail.com. 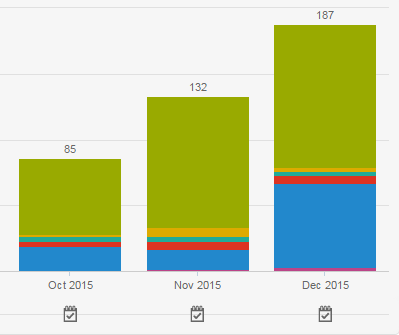 We saw huge growth on the blog in 2015 - with an over 3100% YOY increase in traffic in December alone. We also focused heavily on community-building. 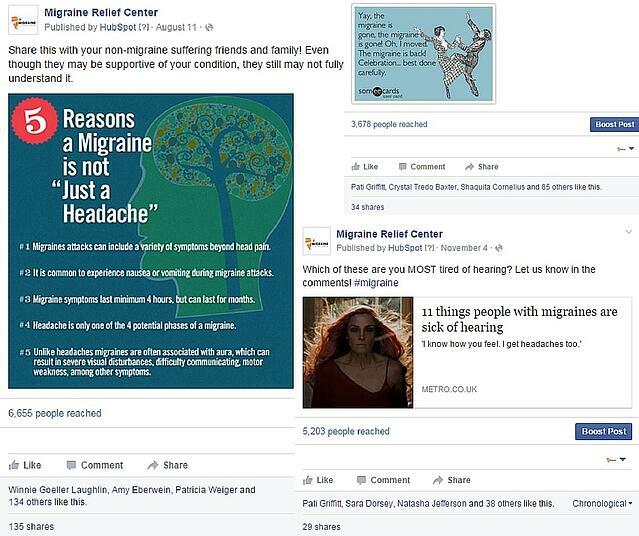 The Facebook page and its following, which we built from the ground up, continues to serve as a go-to resource for migarine sufferers to share their experiences, learn and connect with other migraineurs. In the past year alone, Migraine Relief Center has seen total visits to their website increase by 4850%, with 75% of those visits coming from organic search. Visits to the blog alone have gone up by 3157%, so you can see how effective it’s been as a traffic-driver. Lead growth has been huge with over 1,100+ contacts generated for the year. And social? Interactions and followers are up, but more importantly, visits to the website from social media have increased by 544%. So what about the metric that matters the most? 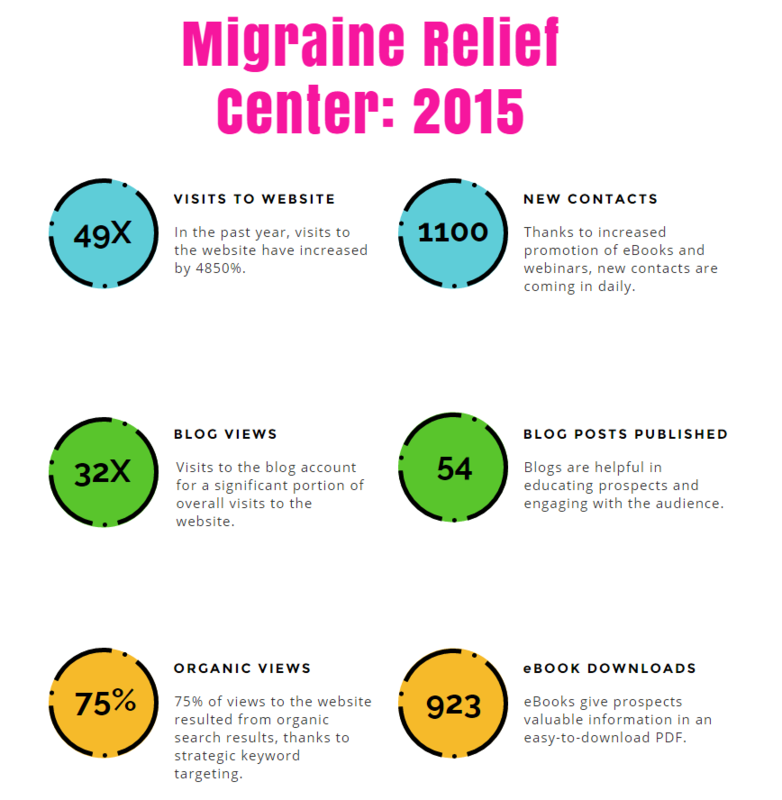 In 2015 inbound marketing brought in an additional $540K+ of revenue for the Migraine Relief Center.